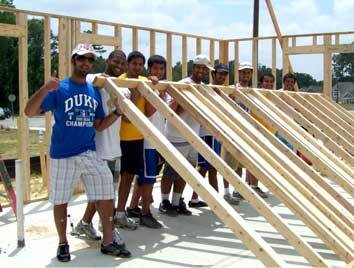 In July, the 2008 ADIA Scholars traveled to North Carolina to help build and deconstruct houses. It was a week of early mornings, long hot days of hard work, and talking about the project and how they played a part in helping others. Two students were appointed leaders each day. It may have been the most difficult week some of them have experienced, but overall it was a great week of leadership building and volunteering. From left to right: Back row- Mubarak Al Hajeri, Ghanem Al Dhaheri, Omar Al Dhaheri, Mohammed Al Khaili, Nasser Al Khaili, Mohammed Al Kaabi, Abdulla Al Hbabi, Project Directors for Habitat for Humanity. Front row- Ahmed Al Mansoori, Saoud Al Neyadi, Abdulla Al Ketbi. This is what the 2008 scholars had to say about the project: We were eager to work with Habitat for Humanity, building houses for the less fortunate; our mission was to put a smile on their faces from a job well done. We were confident that it would be good experience for us and a relatively easy task. However, the first day was quite difficult. It was more of a challenge than we had originally anticipated. Nevertheless, we remained strong from one another’s support and our inspiration to see the less fortunate happy. We learned to use the power tools, how use our hands in building houses, as well as tearing them down. Every day, was a new challenge for us. Regardless of the challenges we endured and we successfully progressed towards our goal, with the direction of our leaders. Our leaders motivated us to continue working. Neither the hard work, nor the high temperatures were able to prevent us from accomplishing our goal. A great end to a great freshman year! !